Occasional Rambling: How much fun can we jam in before nap time? We have lived in this town for years now but never attended the town's holiday celebration. Most years we were traveling somewhere or had other plans, others we just never made it. This year I wanted to take the kids to at least some of the activities. It was a very cold day here on Sunday. Plus there were flurries. But I bundled the kids up and we headed out. I was not sure how it would go. Everything started at noon which was dangerously close to Sean's nap time. 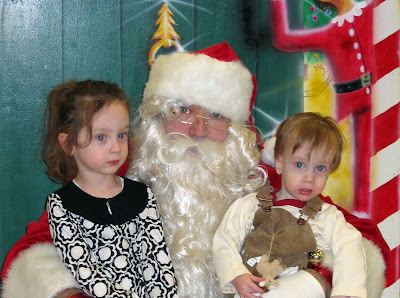 My plan was to visit Santa first and then see how things progressed from there. We arrived at Santa's location not long after noon. It was not crowded at all. The line moved pretty quickly. Although Meghan was excite4d to see Santa she seemed a bit unsure when we got there. But, she did say that she asked Santa for a dolly-doll. When I asked her what Sean wanted she looked at me like I was nuts. "Sean can't talk, remember?" Outside the building Frosty and some sort of Christmas bear were greeting the kids. Once again, Meghan was not so sure about them. This is as close as she would get. 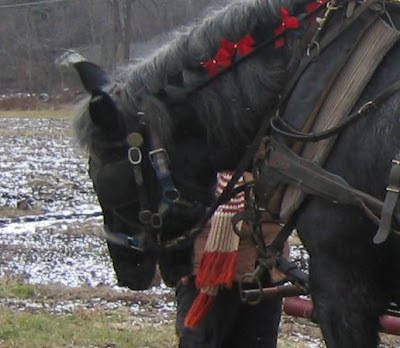 After Santa's visit we headed to a local farm offering horse drawn carriage rides. Sean was super excited to see the horses. He kept "neighing" the entire ride. At this point we had been out for over and hour and my feet were freezing. I wanted to go back to the town common so the kids could see the ice sculptures and we could visit Meghan's preschool. Sean passed out on the way there. Okay, not awful, I could put him in the stroller and maybe we could walk around a but. But then, Meghan fell asleep as we were looking for a parking spot. I decided to call it a day and we went home. Sean napped pretty late so we never made it back for the tree lighting at 4:30. I do think the kids had a good time and hopefully we will make it back out next year.